This was an experiment. However the end result was pretty good, so I thought of sharing it as well. 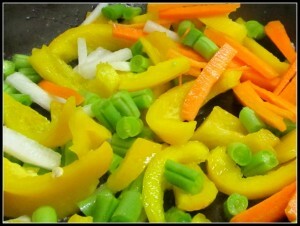 The ingredients are not fixed, I added whatever vegetables I had at home. I added some prawns, since my mother always tells, “if you add prawns, every dish tastes good.” I don’t know the universality of this statement, but till now it has been proven right. Cut all the vegetables in big chunks, no need for fine knife skills. 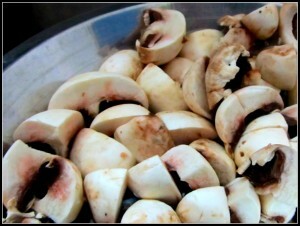 Clean and cut the mushrooms, I usually remove the stem of the mushrooms and cut the button head in four pieces. Cutting the mushrooms take a lot of time. They may look a lot in amount, but they contain a lot of water and shrink during cooking. 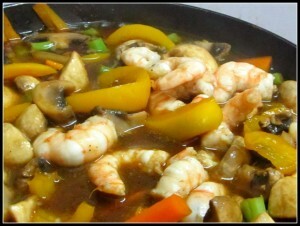 Wash the prawns in running water. Our neighborhood fish vendors usually remove the shell and head of the prawns. But if I want I need to devein (you know that black vein runs at the back of the prawn) them on my own. I usually do this for big size prawns. Most of the time I just leave it as it is for medium or small size ones. You see I am very lazy. However it is up to you. Cook the noodle as per the packet instruction, most of the time the instruction will say put the noodles in hot or boiling water and keep it there for sometime. 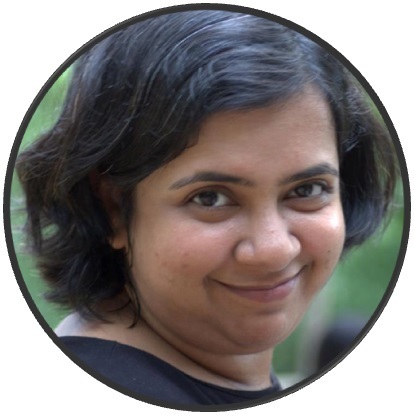 Sometime it needs more, sometime less amount of time than specified in the pack. 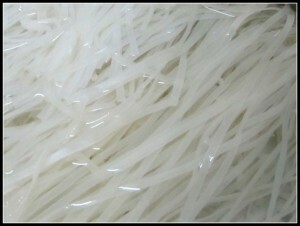 Just try to keep an eye on the noodles when they are soaking. 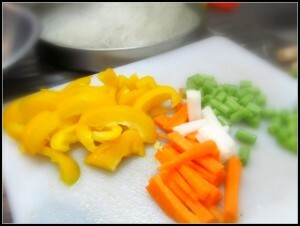 If it gets overcook, it become very sticky. I do not like it at all. Now you have all of the ingredients and you can start cooking. Same drill, take a frying pan and heat some oil in it. 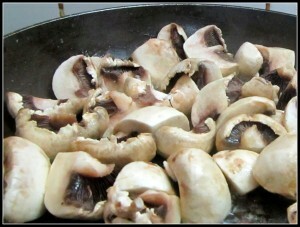 When the oil is hot add the mushrooms, sprinkle some salt and pepper. There will be a lot of water coming out of them, cook till most of the water has been evaporated. When you feel the mushrooms are done, take them off the heat and keep aside. 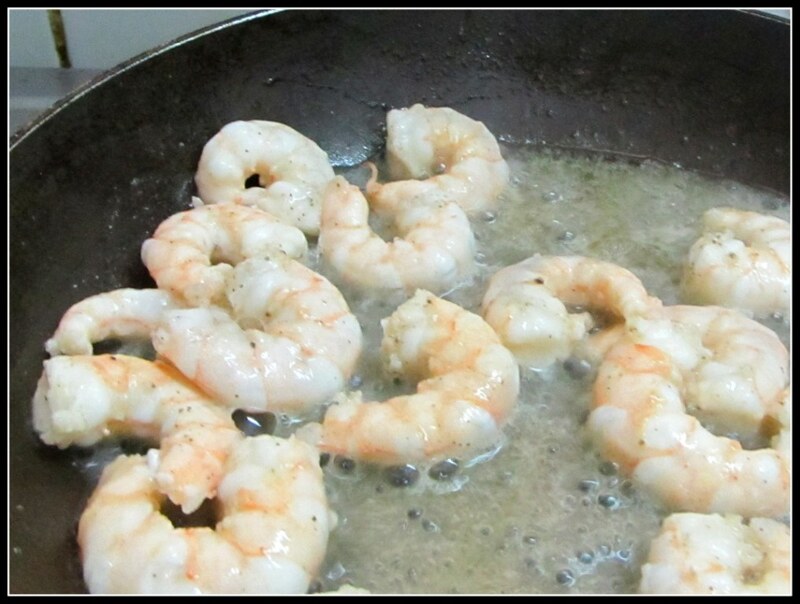 Now put some more oil in the pan (ensure no water from the mushroom is left in the pan, if necessary wipe the excess water with a clean cloth or kitchen towel), add the prawns in the oil and sprinkle some salt. Again a lot of water will come out. 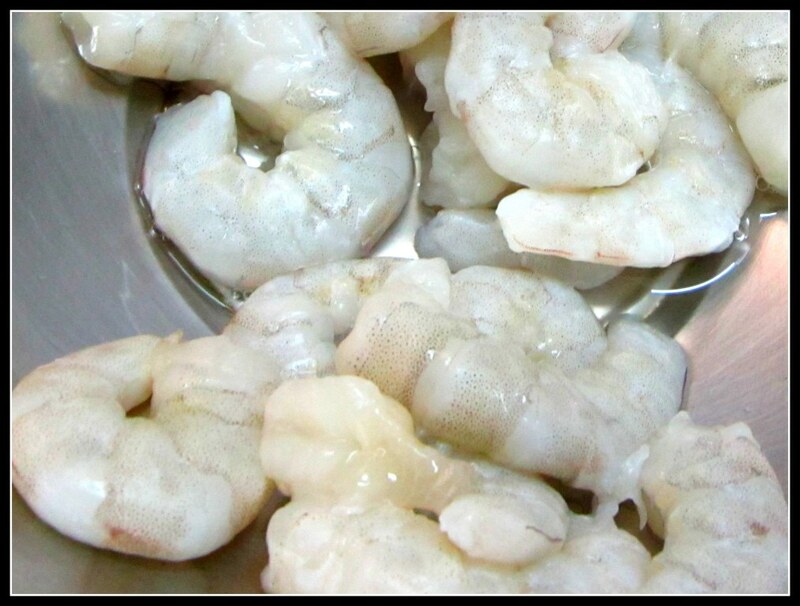 But remember a rule of thumb : if you have started cooking with medium sized room temperature prawns, then maximum time the prawns should stay on heat is 2 minutes, otherwise they will be overcooked. 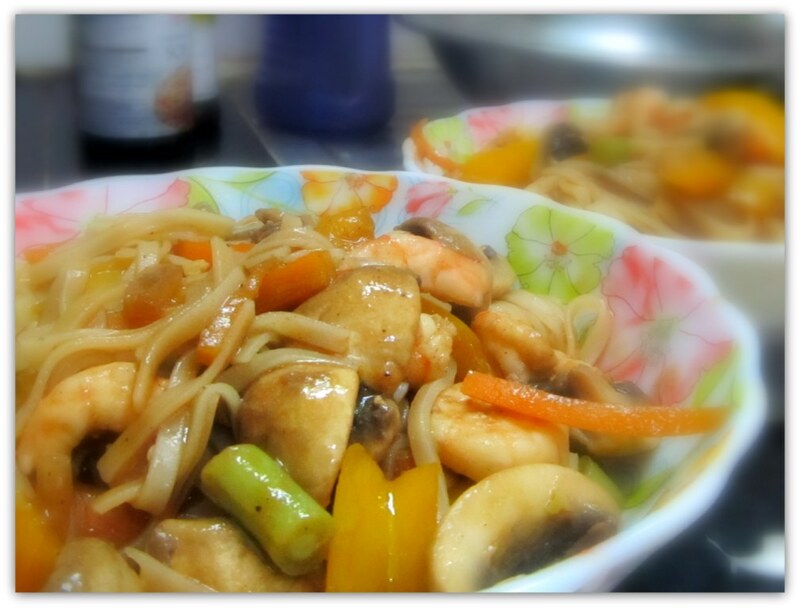 A overcooked prawn is hard and chewy. Take the prawns out after a minutes of exposure to heat when they turned somewhat opaque, since we are going to cook them again. Next clean the pan again of any excess water and saute the vegetables in little oil. 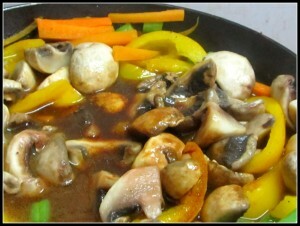 When the vegetables are somewhat done add the mushrooms back in the pan. Add all the spices and sauces. Mix everything well. Add some water. Let is come to a boil. Add the prawns, cook for a minute and remove from heat. Check one prawn, just check that they are not raw in the middle. If they look raw, simmer little bit more time. Take the serving bowl, put some noodles in bowl and pour the sauce you have just prepared, mix the roughly. And you are ready for a treat. Cook the noodles as per the instructions on the pack. Add all the spices, sauces and salt.